I finally became a university graduate with a cool BA degree in Humanities and Social Sciences. Then I went straight into a job in the Bank of Zambia (BOZ), a prestigious employer at that time. At relatively late-bloomer age twenty-six, I’d finally join the ranks of my contemporaries in Lusaka. Some of these had as much as an eight-year lead ahead of me as university graduates at various levels of further academic development, or as already practicing professionals in various fields. What mattered to me at that stage was that I had also “finished school” and landed myself a great job. I envisioned that like everyone else I’d soon start making big money. Yes, I’d also begin to regularly travel to the UK and the USA on business trips. I’d buy myself a Mercedes, get hitched, build me a mansion, and make many children with my wives. Indeed, I’d maintain several mistresses with my numerous extra-marital affairs children too. Oh, yes, I had become a man, at last. Hallelujah! I was at the height of my Karate training, competition, and leadership career in Zambia. At the same time, I was caught up in a mean power-struggle crisis with influential rivals in Lusaka. My crime was to ruffle feathers in conservative Zambian and Zimbabwean Karate establishments. Everybody loves a super star. But superstardom can create serious enemies as well; it comes with the territory. Perhaps during the previous year, 1985, a pioneering professional fitness centre was opened in Lusaka. What was then, by Lusaka standards, state-of-the art equipment in Slim-Trim Gym attracted the Health & Wellness conscious middle class in the capital city. Jane Fonda-inspired Aerobics classes were offered too, led by some of the most beautiful young women in town. I had to join the gym too, of course. In no time I had become a well-paid Personal Trainer for several business executives and sports personalities, notably senior players of the Lotus Cricket Club of the time amongst them. I balanced the PT work and my own specialized fitness training needs as a national team athlete during lunch breaks; also during the hour between knocking-off at work and Karate teaching at the University of Zambia. I worked on weekends too. This was a very hectic schedule, to say the least. During lunch hours over a period of several weeks I had noticed a former high-ranking Zambia National Defence Forces officer making a nondescript entry into the gym and going straight into the Physiotherapy treatment section. He’d come out about sixty minutes later, and leave as quietly as he had come in. I used to notice that each time the senior officer came out of the Physiotherapy section, he seemed taller and more at peace with himself. He also walked with a more agile gait, just like it would be expected of a man of his vocation. One day, during a pause between clients, Physiotherapist John caught me staring in amazement at the General as he was exiting the gym. “Perhaps you are wondering why the big man comes here for treatment instead of the Army Hospital, Simon,” John said. “He needs privacy, I guess. His juniors mustn’t know of his vulnerabilities, no?” I replied. I then booked my first ever professional Therapeutic Massage treatment. It changed my life forever. By the time I left Zambia two years later, I was on top of my game all round. In 1996/ 7, my brother-from-another-mother, Saul Sowe introduced me to something he called Idrettsmassasje. Then my massage experience and journey went to another level. Such that, immensely fascinated by the power of it that I could personally bear witness to, I decided to good to school and study Terapeustisk-/ Klassiskmassaje, Therapeutic Massage formally. That was in year 2000. In relation to professional and personal development, including job satisfaction, my life took an exciting and enduring trajectory that has brought me much joy since. Through the years I’ve met and worked with all kinds of people from all over the world. They’ve all had variable needs regarding their wellbeing as professionals, family members, and responsible value-adding members of society. It’s ever a thrill to look back and reflect on the thousands upon thousands of hours of my Massage work that have had lasting impact on people’s capacity and desire to work at Peak Performance levels. It is scientifically verifiable that people shall be all-round high-level optimal performers when stress and bodily pains do not impede their ability to work with both mentally and physically demanding endeavours, regardless of duration. I’m myself a proud living proof of that. Therefore, it is with the highest confidence that I invite you to dare to make massage an integral part of your personal “Live for Success” package. Book your appointment with me on the link http://muskelklinikken.no/ Our online booking system uses the secure portal by PatientSky. Massage enhances your ability to ignite and radiate your inner power with confidence. Massage improves your posture and the way you carry yourself around. Investment of time and money on massage is an investment in your health. Investment in your health is the best investment you can ever make. This is a very personal tribute. It’ll describe a special relationship that I had with Sensei Noble during the years 1978-88. I write neither doing anybody a favour, nor expecting any favours from anybody. I write out of the sense of devotion he showered me with. The kind of devotion I have for, and have striven to show to my own Karate students, has been an attempt at replicating Sensei Noble’s Karate-Do spirit. I have not had any direct connection, at any level, with Sensei Noble since I left Zambia, in June 1988. Situations and events that are necessarily going to be mentioned in this piece are done so to the best extent my memory serves me. Any inaccuracies arising I apologize for in advance. Names of people mentioned are also done so with but only the best of intentions, and respect. If any inaccuracies arise here, or any insinuated malice is detected, they shall not have been intentional on my part. For that, I apologize in advance as well. In 1986-88, my relationship with my fellow senior students of Sensei Stephen Chan is at rock bottom. We were the core group of the recently formed All Zambia Seidokan Karate Kobudo Renmei, headquartered at the University of Zambia (UNZA) Karate Club, in Lusaka. The issues were around mutual misunderstandings vis-à-vis organizational and club leadership roles. They were also around stylistic interpretations, and expressions of our new Karate style, Seidokan. My biggest sin, though, was to decide to unilaterally take on Zimbabwean, Jimmy Mavenge, late, under my tutelage. I had trained the latter, and subsequently graded him to Sho (1st) Dan Black Belt in Seidokan Zambia Karate. The goal had been that he would, upon his return to his country, take Karate to the people, de-racializing the sport in the country in the process. Jimmy Mavenge’s rebellious Black Belt grading took place during the middle of the second half of 1987, if I recall. The Seidokan Zambia Black Belts I had invited to witness the event weren’t, of course, willing to be part of the grading panel. That included Sensei Noble. They decided to take up positions on the mezzanine in the UNZA Sports Hall. So, I carried on solo. In superb fitness state, his former guerrilla mutinous spirit tuned high, Jimmy ran through his gradings’ required routines like a possessed man. He passed with flying colours. Awarding him his diploma, I took my personal black belt off me and passed it onto him. The club had almost collapsed following the squabbles of the senior Black Belts. At some point, only Jimmy and I would turn up for training. When he left for Zimbabwe, a few weeks after the gradings, I was left alone. I do not recall if I ever did get to have a formal position in the then Zambia Karate Federation (ZKF) Board of Directors cabal. But I got to coach the Zambia Midlands Karate Team in 1986-88. That meant that, although the Zambia Seidokan deliberately excluded me from certain events, Sensei Noble and I would often meet in connection with our ZKF work. The Sensei was the active patron of the ZKF, then. In the ZKF domain, our relationship was as amicable as ever. I shall take the writer’s prerogative and postulate that I have sat 10 000 miles with Sensei Noble in his car; all in ZKA related training and administration matters in Lusaka, and between Lusaka and Kitwe, in the Copperbelt Province. That would also include a trip to Harare, together with the Zambia National Karate Team, in 1981. Although I had no idea of it at that time, my Sensei-Student bonding with Sensei Noble took place in those 10 000 miles I’ve sat with him in his car. “You have upset many people, Semmy. Stephen Chan Sensei is not happy with you at all. You have infringed upon Sensei Chiba’s territory. No good, no good at all, Semmy!” Sensei Noble said to me during one of our trips. This was sometime in early 1988, about six months after the Jimmy Mavenge gradings scandal. By then, I had already been to Harare to check on his progress. I went on to explain how Jimmy had started to train children and youth at Harare’s Mbare township, where the not so fortunate people lived. He had also started to teach Karate at an orphanage run by a close friend of his. All for free. On the other hand, Sensei Chiba ran a private dojo in the city centre, catering for the paying middle class, predominantly white. Efforts to reach out and pay a courtesy call to the senior Japanese sensei had been futile. I’m not quite sure now, but I have a vague recollection that, not long after I had left Zambia for Norway, Sensei Noble did drive out to Harare to check on Jimmy. On the trip, he had taken along one of my absolute meanest detractors. The rest is history. While giving him the report on Jimmy, what I did not tell Sensei Noble was that my work with the former was, in a large measure, influenced by his off-the-mat teachings. “You see, Semmy, everybody wants to lead. But people don’t realize that leadership is something you grow into. I’m really not sure if those guys are ready to lead the club. However, they want it, so they can have it. My conscience is clear, I have taught them only the best of Karate available in the country, if not all of Africa. If they now feel they know more than I do, fine by me. They’ll soon find out that real Karate is not found in books. Books guide. They don’t teach. Lasting knowledge is learned man-to-man,” Sensei Noble said. The Sensei was in his forties at this time. One year later, Trinity Karate Club was in such leadership crisis that it had to close down. Indeed, my work with Jimmy was a well thought out venture. I did it with love. I believed in the man and the cause he pursued, in that regard. My conscience was clear: I had no pecuniary, nor power interests; I was simply doing what my heart told me was right; I believed I had acquired sufficient knowledge to empower Jimmy to shake up the then racist Zimbabwean Karate establishment, and it worked; although I felt no need to prove it, I knew that I was strong and skilful enough to give anybody a good fight should the situation degenerate to that level. I would have been just too happy to break an enemy’s bone or two, actually. All this I had learnt from Sensei Noble’s way of Karate. I do not recall how long the Sunday morning training sessions lasted, but it was many, many Sundays. True to his word, Sensei Noble would come and pick me up from, and take me back home. No complaints. No demands. Just training. I used to find it strange that this man, who also taught children at the Lusaka International School on Saturdays, did not take even a Sunday off in order to be with his own children and wife. More than twenty years later, Martin Rice, a very special, Sensei Noble’s younger protégé from Ireland, is visiting us in Norway. Naturally, we begin to talk about our experiences with the legend. I mention the Sunday sessions, and the lengths to which our grand Sensei went to accommodate me. Sensei Noble’s devotion to the Zambian Karate community that he raised single-handedly, at least in the Midlands, up until the 1980s, has made a lasting impression on me. That he even had the extra capacity to work with the select few of us in the manner that he did touches the softest of my emotions to this day. Back in Zimbabwe on a normal civil servant’s salary, Jimmy no longer had the kind of cash he used to have whilst on his diplomatic tour of duty in Lusaka. He couldn’t afford to pay for my visits to him. I visited him twice during the first half of 1988. Through working with Sensei Noble, I learned that a Sensei must be self-sufficient. A Sensei that depends on sponsorships and donations cannot do his work effectively. On a drive from Kitwe to Lusaka, Sensei Noble is cruising at between 140-150km/ hr. A Mercedes Benz overtakes us like it was a bullet, and soon disappears from our sight up ahead. Perhaps 15 minutes later, we approach a road accident spot. The Merc had overturned. It had rolled several times, apparently. Totally wrecked. “Yes, that’s what you get when you drive at a speed like that on roads like these, Semmy. Karate teaches us to always be aware of our surroundings in relation to the actions we wish to undertake. From that, we can calculate and predict likely outcomes. I knew that that car wouldn’t reach Lusaka, driving at that speed,” Sensei Noble spoke wryly as he drove past the accident scene. We would learn later that the driver of the Merc had died on the spot. The grand Sensei has told me that when he first came to Zambia in the early 1950s, he had only the amount of pocket money a fresh university graduate from Scotland would have in those days. Not much. He landed somewhere in northern Zambia, somewhere around Lake Bangweulu, if I’m not mistaken. To pay for his hotel stay there, he offered to hunt game for the establishment. That’s how he started off in Zambia, a place he had come to with no intentions of living in permanently. Yes, Sir, I do. But until the greater things come my way, I’ll do what I gotta do to survive here and now, as per my Sensei Noble’s teachings. Whilst in Harare with the 8-man Zambian National Karate Team, in 1981, I was singled out to join Sensei Noble as he joined two other Zimbabwean senior Black belts (whites) to tea at the home of a Japanese diplomat. I do not remember the name of the diplomat. Present were also the dreaded Sensei Chiba, and two other Japanese Judo Sensei. I was a not so sophisticated, little 20 year old schoolboy, then. But the grown up, senior Budo masters were real nice to me. I recall Sensei Chiba advising me to use whatever nature provides to train with, if I cannot go to the gym. “If you do not have a punch bag, there is always a tree to punch!” he said. “Hoss, Sensei!” was all I could say. An aspect that is not spoken much about is that, in his pioneering work of opening up possibilities and teaching black Zambians Karate from the late 1960s, Sensei Noble was, actually, treading on thin ice. That’s because, in my view, that was a time of numerous state coup d’états across the African tropics countries. White mercenaries, whom the media romanticised as Martial Arts experts, led many of these coups. “Mad Mike” Hoare is the first name that comes to mind here. A reliable source has disclosed to me that there were concerns that some of Sensei Noble’s Karate students could be enticed to join the lucrative (for those who don’t die!) mercenary bandwagon. So, relevant Zambian State Security organs closely watched him, and the whole lot of his prominent senior students. I am sure that there are many others in the Zambian Karate fraternity who’d concur with me that Sensei James Bonar Noble gave us, individuals, and the collective much more than we could ever ask for. He, like other ordinary mortals, was not perfect. I, for one, am not in a position to cast any stones. Unfortunately, by the time the roses in my garden bloom in the spring, I’ll have relocated to another abode. My heart felt condolences to the Noble family in Lusaka. The same applies to the Zambian Karate fraternity, if not the nation, for the coming to an end of a life of an illustrious service to the people through the Martial Arts. Many of Sensei Noble’s students and their own protégés continue to tread upon the selfless path of humility, giving, and devotion that he started. Their impact is felt across the cross-section of the Zambian society. Some are also forces to reckon with in various parts of the world. Sensei James Bonar Noble may be gone, but he shall never be forgotten. His legacy is just too deeply engrained in the psyches of many of us. May his soul rest in eternal peace! Growing up in the old, subdued black South Africa, I could never see myself playing serious football in a formal club setting. From the point of view of personal drive, the game has never charmed me that way. I could never say whether or not my lack of success as a junior street football player was due to being untalented, or simply that my passion was never aroused strongly enough. I’m inclined to suspect the latter. ©Simon Chilembo 2018. 2006/7, with Abel Nkhabu, a.k.a. Moya, Mgeu, legendary pioneer South African professional football player. Family friend, mentor. In the old, apartheid South Africa days, football talent groomed itself, and thrived on the township streets, and rural playing fields. It was raw, pure, and ecstatic. Paradoxically, it provided spaces for all the joys of a free childhood in a then tyrannical state. Moreover, my childhood street football reality provided escape from the attendant ills of poverty in many a black South African home: all round domestic violence, woman and child sexual abuse. Like most South African township boy children, I imagine that the first expression of my active physical power, from the time I managed to stand up, balance, and walk, was probably to kick at something. I have been kicking for as long as I can remember. Ball control, reading the game, and stopping opponents from scoring against my street team were my forte. Dribbling was never my inclination. But, I recall, even the very best of our dribblers during my street football active years, up to age 12 years old, knew well not to fool around with the ball around me. If I had any football talent at all, it shone brightest whenever we opted to play a rather rough version of the game. Often, if it’s genuine street culture, it has to be rough; it has to be tough, it has to break all the rules, like Rock & Roll. Here, the object was not to score goals, but for the competing teams to incapacitate each other’s players until there was only one young man standing, with the ball. If the one team totally demolished the other, the winning team’s members went for one another, then. Thus, the last man standing outcome. It gave an unforgettable, ego-boosting adrenaline rush. Great, great fun, it was. In this brutal game, we had to be subtle, but extremely effective. That was so that if any adults were watching us play, they wouldn’t understand that we were, actually, out to deliberately injure one another. A strict rule was “no ball, no attack”; meaning that we went for one another only to the extent that one side had ball possession. And, direct kicks to the legs above the ankle were not allowed. The idea was to “slice”, or “chop” each other’s legs at the ankles, much like Karate players execute the devastating leg sweeping technique called “Ashi barai”. Serious injuries, necessitating hospitalization, often occurred here. I never got injured. Several casualties have pointed to me, though. In action, I can be light and quick on my feet. I developed this ability from this dangerous kind of football playing. I would, later, take the skill with me to Karate. Fifty years on, I’m still standing, rocking as if there’ll be no end to my rolling life. Truth is, I want to live forever. I am a dreamer, and so shall it be. My street football career was much fun, whilst it lasted. It gave me lasting valuable life lessons, as well: street survival alertness (“Tsotsis”, violent street hustlers, didn’t play football! ), and fierce competitive spirit, or killer instinct cultivation. Street football also afforded me the first real taste of leadership, going into puberty and subsequent young manhood. The leadership trial run would reward me with just as premier and unforgettable taste of the thrill of victory. That owing to the coaching my impromptu leadership role empowered me to do with my team, one day. A team had challenged us from another part of our township, Thabong Location, Welkom. Our challengers were notorious for severely beating up their opponents when they, the former, lost matches. These guys were a little older than us, and they had some of their neighbourhood supporters following them everywhere they went. Our team, on the other hand, was, usually, an ad hoc affair. It spontaneously organized itself around whoever was available on our street, and wished to play, there and then. Unfortunately, on the day of the challenge, whereas we had more than what we needed of potential players, no one wished to play. All were afraid of getting beaten up by the visitors, in the event of the latter’s loss against us. The problem was that the visitors were still going to be violent if we chose not to play. These guys, the challengers, were crazy: when they won, they still beat up the opponents, if only to teach the losers not mess with the bad guys! So, either way, we were in trouble. Catch 22. I do not seem to recall what led to my team prodding me for a solution to the dilemma we were in. They even decided that I should be the team captain for the day. Because I had already started training boxing by then, a thought struck me that if I made my team believe we were strong as individuals and as a collective, we could win in such a way that the bad guys wouldn’t want to fight us afterwards. How? Let’s wear them out, whilst we remain strong all the way, throughout the match. How? Let’s do what nobody else did at that time: do a pre-match, team spirit enhancing jogging and calisthenics session! It’s called warming-up these days. Doing that would also give us a psychological edge over the opponents. It worked like magic. My team played with the intensity and unity of purpose that we had never thought were possible before. In my head, I still vividly see replays of the match to this day. Playing on what we, then, called the “12 hurra!” principle, we beat the bad guys 12-0. The loss, combined with my team’s upbeat, super confident mood, overwhelmed the bad guys so much that they left our zone running as if they had just seen snakes, or some scary monsters like that. Eventually transferred into Karate, I have enormously enjoyed sports leadership and coaching since. I’ve won, I’ve lost. I’ve been stupid, I’ve been wise. I’ve made friends, I’ve lost friends. I’m here. I live. I love. Adult club football was a different ball game altogether. I enjoyed watching this, not so much for the thrill of the game, but out of the fascination I had for those players that stood out as the best in the game, regardless of position played. The fascination was about the aura these guys seemed to carry, both on and off the field. They seemed to be ever so strong and happy. It’s always been a great fascination for me as to how men, and women these days, running after, and with a ball could, at the same time, induce so much euphoria amongst the spectators. Off the field, the super star players seemed to wield so much power that it appeared, for me then, as if they could be rulers of the world. That was despite the fact that I, at that time, I had no real clue as to how gigantic and complex the world really was. They had all the beautiful girls. Attendant hyper fornication scandals I didn’t care much about. Rock & Roll is what it is: you burn, you burn. If the highway to hell is short, let it be. I’ll talk to Mother Mary another time. One of those super star players was Abel Nkhabu, a.k.a. Moya, or Mgeu, late, 2017. May his soul rest in peace. I first came to personally know, and look up to him in the years 1972-74. Looking back, I like to think that, actually, this man was my first real-life, non-family Super Hero. He seemed larger than life, and, yet, he could touch me, ask me about my wellbeing, and encourage me to be good at school always. There were also some of Mgeu’s generation of original black South African football mega stars around. By status, they were bigger than him by far; they have remained so, and are, today, living legends in their own rights. I still look at them with awe; still getting that tingling sensation in my hands and feet I used to get at their sight, on and off the pitch, in my early teens. These men, in various capacities at club and national association levels, continue to steer modern South African football. They are doing so with the same inspirational class I recall from the early 1970s. In them, I still see hope for this troubled land of my birth, South Africa. However, these men are still far away from my immediate spaces. They have yet to touch me like Mgeu did. A consolation, though, is that, in my eyes, they carry on his spirit, and that of numerous other giants of the pre-1994 South African football scene. Much of my desire to defy and beat the odds in order to succeed in life, be a super star, and live forever, is owing to these men of wonder in the history and development of this land. There is more to football than just seemingly mad twenty-two men chasing a ball around a stupid rectangular space limiting their freedom to run away with it, the ball. Inspired by the big and strong, unbeatable Hercules in the bioscope, I liked making leather wristbands for my friends, my lebandla, my street gang, and me. The finest I ever made was of some fine, thick, nicely patterned leather piece from one of my mother’s old handbags. Mgeu liked that wristband so much that he borrowed it for a while. He wore it on several big matches he played, with Welkom Real Hearts FC. I refused Mgeu’s offer to buy the wristband. Of course, I was taken by the symbolic power effect it had on him. I wanted to have the power too. When he, eventually, gave the wristband back to me, he was overwhelmingly effusive. An ordinary older South African man would have bullied me and kept it, anyway. Mgeu’s return of the band permanently cemented the bond that we already had. Before that, no other adult man had ever shown me that kind of respect for my personal integrity. It was gratifying for me to find that there, in fact, were still some grown up men one could trust. As first-born child in my family, I was raised to love, protect, and support my younger siblings, that as a matter of course. My general love for children and youth derives from my upbringing values. From the time I became aware of my sibling position and role in the family, fondness and caring for those younger than me, to beyond my home, was something one just did without question. It was something I never put much thought to, even. My younger, and last-born sibling, Lucy Dintletse’s birth, in 1974, brought the real intensity of my love for children to my consciousness for the first time. Lucy’s affectionate family nickname is Sonono, often shortened to Sono. The very nearly nine years of her life would thrust the love to heights I have yet to fathom. MHSRIP. I see Sono in every child of the world. Whenever I see children of the world suffer under mankind’s proclivity to wars in outrageously vain attempts to impose peace upon one another, her sweet face emerges above the misery I see; the pain, the hopelessness I feel. And, then, faith that, someday, we gonna be alright, is rekindled. Through every child whose life I touch wherever I am in the world at any one time, my steadfast hope and wish are that, one day, these children will grow up to be conduits of love and peace for all mankind. 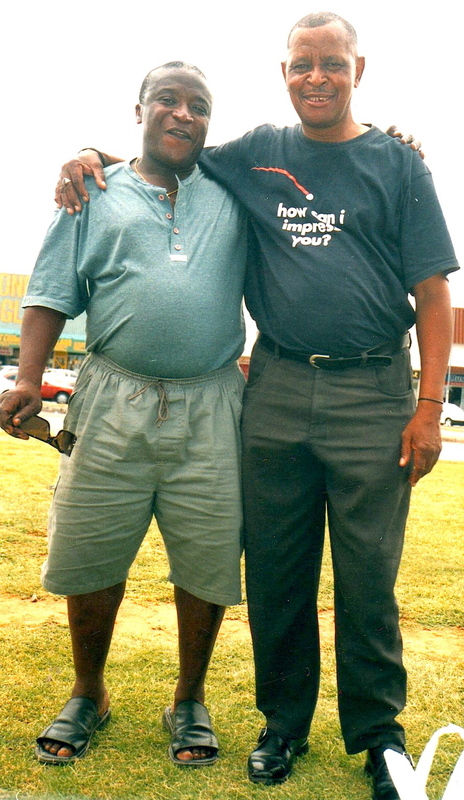 Mgeu was one of the pioneering black professional football players in South Africa, in the early 1970s. He made a dashing and influential figure, to his grave. His entire life, he was fiercely anti-apartheid and black people’s oppression. From Mgeu, I learnt that a man could be big and strong as a super star, but he could still have time and energy to engage positively with children and youth. This has remained one of the key defining moments of my life. Whereas my father remains the formidable force behind my formal dressing taste, my smart-casual dressing style has heavy Mgeu undertones. My father was laid to rest twenty years ago today, July 04, 2018. MHSRIP. I remember him with immense love with this article too: my father, the finest of gentlemen, my hero; the original Machona – (the) Emigrant, the traveller, the gypsy from the warriors of love mystics of my Tumbuka people, Eastern Province, Zambia. If you jump into Malawi, Tanzania, and, partly, the Democratic Republic of Congo (DRC), you’ll land into the midst of the extended empire of my people. ©Simon Chilembo 2018. With Big Daddy Cool, Sir E L W Chilembo. Pappa’s picture taken on my 21st birthday celebration party, June, 1981. The one quality I’ve not quite been able to grasp, though, is the phenomenal “Ladies’ Man” tag Mgeu proudly carried to the very end. If we meet up again on the other side, I should ask him for specific coaching on this one; assuming that there’ll still be ladies abundance when I arrive there. But then again, we might find that the ladies on the other side are more work than what I have down here on earth. Nnnahhh, we let this one pass. In the presence of Mgeu, I’d always feel like a 12-14 year old boy, if not even younger. In the photo accompanying this piece, we are meeting up soon after I had arrived in Welkom, from Norway, Christmas time, 2006/7. You know that sweet, loving feeling you get when you are with your favourite uncle, I had it at the time the photo was being taken; I’m feeling it as I write this article, at this very moment. Thanks, football, for one of the most significant men in my life! I was fortunate enough to have had a few good men to relate to during my formative years. Many of those that were not so nice to me never lived to see the close of the 1970s. Good riddance. A lot of these not-so-nice men were generally unkind to youngsters. It’s just as well that longevity was never to be their gig. Morons! In my dealings with children and youth, I endeavour to be, at least, as good as those adult males that have, each in their own special ways, contributed to my being the mad energy bundle that I am, now as a fully grown adult myself. I have never been able to think of a better way to express my deep felt gratitude for the presence of good men in mine, and other children’s lives. In the early 1970s, Mgeu, together with a host of other first generation of black professional football players were organized under the auspices of the then National Professional Soccer League (NPSL). In my forthcoming 6th book, 4th novel*, read how these transformed the lives of the black people of South Africa, at a time when the then South African apartheid regime was at its most venomous. The NPSL effect is played out around a particular family’s life in Thabong, Welkom. Watch this space for more information about the impending book release. Coming soon! We live in necrocratic world. We, the people of the world, live at the mercy of our world leaders. We may be breathing and blinking about at this one moment. The next, we are obliterated from the face of the earth. BOOM! so fast and loud we can’t see it coming, we can’t hear it land, we can’t feel it explode. Just like that. Like with the snap of a finger. Death is death. Murder is murder, regardless of who executes it, no matter for what cause. Murder sustains necrocracy the world over. As a concept, an instrument of power, and process, leadership is, by default, murderous. Any person that, by any means, legitimate or otherwise, depending on the dominant existential paradigm in a given domain, assumes power over others, automatically becomes a potential murderer. The probability of necropower becoming a reality for a leader is directly proportional to the joint organic and structural complexity of the organization they lead. We see the highest of such sociological complexity at the national leadership level. Therefore, all national leaders at the top of the decision-making hierarchy will either be directly murderous as individuals, or be directly responsible for murderous acts committed by others on their behalf. All in the name of national security, in defence of national sovereignty, territorial boundaries, and in support of allies in international solidarity treaties in times of strife in various parts of the world. In this regard, at any one time, no state leader can be seen to be better or worse than any other regarding necropower atrocities; be they locally, regionally, or globally. Murder is murder. Death is death, regardless of who dies, no matter for what cause. Death is the food of necrocracy the world over. But all life is sacred. No matter the race, colour, creed, and all the possible permutations of the condition of being human on earth. On the grander scale of conflicts, wars allow necropots to manifest the full range of their respective psychopathic dispositions. We die, we survive, we cry, we fight amongst ourselves, we mobilize mass anti- or pro-war protests, we run away to other lands for shelter, we are pro the one necropot contra the other/ -s, we go to the United Nations, we get peace-keeping forces, and we still die; all of us: children, women, men, combatants, cats, and dogs. Observing all this, these necropots just laugh at us. They think we are absolutely crazy. Murder is such fun. It is such profitable business. The bigger, the more enduring the wars, the bigger the party for the necropots on either side, the more the money made by the war industrial complex, the more the blood on necropots’ hands, and the blinder the necropots get. Wiping the eyes with their bloodied hands, the necropots cease to see reality for what it is. They can only smell and taste blood money everywhere, oblivious to how they have led necrocracy onto an effectively self-destructive path, taking down humanity together with it. They seem to think that a nuclear bomb is a joke. Climate change, well, let’s not go there at this stage. And we help them, necropots, along. We take sides. Our senses of right or wrong are clouded by our ideologies, personal ideals, identities, ambitions, psycho-social attributes, and much more. We go out and intellectually, psychologically, and spiritually kill those that do not share our views of the world, as in par with our chosen necropots. Pro-necropot logic: It’s okay, our chosen necropots are not murderers, they only, necessarily, kill in self-defence, even if those getting killed are their very own people. The enemies of our favoured necropot carry out genocide, you see. Our favoured necropots are strong leaders; they only want to achieve the best for their people. It is irrelevant as to whether or not the people approve of our favoured necropot. People are stupid. Only strong leaders like our favoured necropots know what is good for the people. It’s okay if some of these stupid people have to be killed in the process, you see. From time to time, a bit of ethnic cleansing never hurt anyone. Our favoured necropot is breeding a nation of sheep people. These will abide by his rules without question, you see. Wouldn’t it be nice if people understood that good leaders, like our favoured necropot, are made and chosen by God for the people? Punishment for those defying God’s will is death. By killing his enemies, our favoured necropot is only carrying out God’s will. May the wrath of God fall upon the external enemies of our favoured necropot! We live in an age where necrocracy shouldn’t have any space to breathe. We live in an age where it ought to be crystal clear that a war on another cannot stop war, or other wars. In this day and age, fundamental human wisdom ought to be at the general understanding that, irrespective of how we colour and name organized, systematized, militarized killings of human collectives by others, murder remains what it is: murder. Murder doesn’t change character just because it is committed for a worthy cause, as the proponents may perceive it. We live in an age of stalemates in war. National leaders of the world shall go into their graves with our blood perpetually dripping off their hands. Eternal necropots. The whole lot of them. Ain’t nobody better. Ain’t nobody worse. All as equally guilty of mass murders as hell. The only difference being in numbers. However, even one person slain is one person too many. There is no way anybody can ever win a war lastingly in this Fourth Industrial Revolution (4IR) age. Albeit in variable degrees, as shall be determined by intellectual and resources capacity, any nation, or subversive group has access to all that is available of knowledge and technology to wage a war, either or both conventional and guerrilla style. Cease fires and progressive peace and reconciliation talks ought to be the order of the day in our time. Peace and reconciliation talks assume, before everything else, humility and mutuality of respect for one another from all the parties concerned. The same should apply on the ground, from supporters and activists on all sides. Arrogance and bullying will never lead anybody anywhere. Never. Only back to war. Guaranteed. Nobody can ever be coerced to come to sit around a negotiation table in the absence of the recognition of their humanity, no matter how banal it might seem to third parties. Outsiders can never determine what people know and value about themselves and their place in the world. This is what is at the core of all wars of liberation across the world, both historically, and in our contemporary world. As a warrior, I know that if somebody unjustifiably hits me, I will hit them back, if they haven’t killed me. If the situation calls for it, I’ll murder them without thinking twice about it. There is a potential necropot in all of us. Nevertheless, if I ever will have to kill, it will be in the protection of my own life there and then. It will never be out of the need to sustain my power and dominance over others, in any given situation. As a leader, I don’t need to be told that I’m no longer relevant. More often than not, I can see potential power antagonism looming from afar. If, after weighing my options, I deem it justifiable, in view of the bigger common good threatened, I’ll nip the antagonism in the bud. Otherwise, I pack my bags and leave. I, both as a matter of principle and personal proclivity, will never impose my leadership on unwilling people with whom I’m supposed to be pursuing a common course. As a private person, in whom it is encapsulated my warrior spirit and leadership potential, I am conflict shy. I’m conflict shy to a point of misrepresented cowardice, up until I have to fight, if called upon to. Conflict gives me a headache. Especially if it is over situations that do not make sense to me, or over matters that I consider not as adding value to my existential imperatives. Such conflict disorients me. It makes my body itch. Conflict makes me want to sneeze, but constricts my chest at the same time. I’m acutely allergic to what I consider to be nonsensical conflict pursuits founded on ignorance, parochial thinking, and poor philosophical principles, if any at all. I am conflict shy not only by choice, but also by natural disposition. Therefore, I am not prone to militant activism. It is not about lacking the guts, or having no spine. I am simply not confrontational by nature. I am just not wired for unrestrained, militant activism. Neither am I inclined to evangelism with respect to life values I stand for, and the choices I shall want to, and, actually make in my life. I speak and shout with my writings. I also often express my life views in professional, and other social engagements endeavours I’ll find myself in from time to time. It is what it is. Take me or leave me. I am anti-necropower, regardless of the practitioner, or their cause. Murder is murder. Necrocracy has no future. The little I know about my mother’s life inspires my forthcoming fourth novel, which will be my sixth book. As I progress with the work, I get to appreciate more and more that a wife and mother will do what they have to do for the good of their children and the honour of their husbands. At the same time, wives and mothers are also made of flesh and blood; they are human too, just like everyone else. They shall slip and fall, gather dirt like everyone else. They shall rise, shake themselves from the dust, and fail to erase the stains; just like everyone else. If the good they did for their children, and the honour they bestowed their husbands is greater than the outcomes of their fallibilities, then, who is anybody to judge? Just in terms of numbers, South Africa and Zambia cannot be equated. Of course. The former outstrips the latter by far: from territorial boundaries dimensions, population sizes and overall demographics, natural resources endowment, optimal economic potential and actual performance, to military power. Numbers don’t lie. It goes without saying, therefore, that at any one time, any one variable or all highlighted above considered, South Africa will, in real terms, be a much more complex society relative to Zambia. Meaning that politics in South Africa will, correspondingly, be a more challenging enterprise for those involved in the national political leadership arena, whether in ruling power or in the opposition. Needless to say that there are, indeed, countries smaller than even Zambia, but happen to have much more intricate political intrigues than South Africa. Another time and another place for the last observation raised. A simple Google search will either confirm or debunk my assertions above, much as it will do with many of my postulations throughout this presentation. Politics is the science of government. Government is the collective of institutions, including their constituent leaderships and functional personnel. They are created to enforce societal progress rules and policies that are arrived upon by the representatives of the body politic. The government, or the state, will often reflect the interests of the dominant political parties. However, through corruption and greed, the dominant, ruling political parties may themselves be subtly steered by peripheral influential, manipulative economic forces. These may either be local or international actors, if not a combination of both. In South Africa, the concept called “State Capture” describes the collusion between the powerful economic elite and the government. Notwithstanding the “State Capture” phenomenon, the interests of the respective political parties are often shaped and differentiated by their cardinal ideologies. An ideology is the summation of ideas based on theories and policies of political and economic engineering of society. Ideologies are applied in varying ways to indoctrinate particular societies to address and find solutions to existential questions and challenges in certain pre-determined, and non-variable methods. Therefore, ideologies are not only critical for shaping individual countries’ internal living conditions, they also influence individual countries’ international relations premises; i.e. which countries will have mutually cordial diplomatic relations with one another, which supranational institutions the countries will be members of, which international solidarity causes countries will engage in and at what cost, etc. In contemporary times, historical factors leading to the creation of specific nations often contribute to the kind of ideology adopted, developed, or redefined to suit local conditions. A nation’s wealth, often with particular reference to its relative strategic significance to the major economic and political nations and power blocs in the world, will also have a bearing on the nature of the dominant ideology. A subservient country’s geographical location on the globe can further add to, or reduce its strategic value. At any one time, a quick reality check will show that relatively newer and smaller nations with both perceived and real strategic importance to the major political and economic giant nations, e.g. the industrialized Western world, have a hard time determining their own, sovereign national ideologies. Old ties bind some of these emergent states with their former colonial masters from the Western world. Others will be held in infinite indebtedness to comrade states from the Eastern socialist, or communistic countries that helped in their liberation struggles for independence. It is in the light of all the above that I choose to look at the comparative legacies of Nelson Mandela of South Africa, and Kenneth Kaunda of Zambia. Comparative because of the many critics of Nelson Mandela, who, in my view is unfairly battered in relation to the critics’ view of to whom real Southern African statesmanship ought to be accorded contra Kenneth Kaunda’s legacy too. I specifically address myself to Zambian critics. I must declare that this is a non-solicited presentation. It is only an outcome of the involuntary workings of my critical thinking mind and its creative processes. It is my subjective, free world intellectual response to the foul anti-Mandela vis-à-vis Kaunda sentiments I have seen expressed in the various social media platforms, particularly Facebook, for many years.It is not my goal to want to be malicious against anybody. Neither is it my intention to seek or expect approval, favours, or rewards from anybody.